The first second each episode starts you know you're in for a treat! The opening titles are a wonderful combination of funky typography and playful silhouettes set to an amazing soundtrack thanks to the music by Yoko Kanno and performed by the The Seatbelts. The down on their luck crew of the Bebop always seems to live on a ramen diet which would make any college student feel at home. Clearly in the future interplanetary travel is no biggie, but keeping the fridge filled is a huge challenge. And to me this is one of the little touches that makes the characters in the show so very real. In a rush to political correctness cigarettes have disappeared from our television sets, so seeing them in Bebop ironically seems like a breath of fresh air. The use of smoking harkens back to so many classic film noir movies and really sets the atmosphere. And of course as a matter of public safety we remind you that these are in fact cartoon characters, so please don't try this at home. 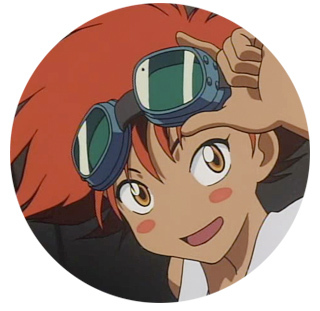 Bebop never shoves its science fiction setting into your face, but there are nice touches that show you that a great deal of thought went into the world building of this universe. I really love how every now and then you'll see characters in zero gravity or bring up some insight into why humans are mostly living on Mars these days. Once upon a time anime show back in the 70s and 80s were all about the mecha — each series had to blow you away with a giant robot or an amazing spaceship the size of a planet. Then suddenly this went out of style: And yet Bebop wasn't afraid to show off their hardware with pride. And who amongst you wouldn't kill to own the Swordfish? The World Needs More Girl Hackers! When was the last time you watched any show where the leading geek character was a girl? And add to that how many anime characters have been inspired by Pippi Longstocking? I wish there more characters out there like Françoise Appledehli — who is also known as Ed (short for Edward Wong Hau Pepelu Tivrusky IV). And what's not to love about a super high IQ Pembroke Welsh Corgi? The mark of any great anime series or film noir movie is when your lead antagonist is as just as interesting as any hero (or anti-hero) in your story. We never get to see much of Julia, and yet she seems to show up in every episode because she haunts Spike so much. By the way if your curious as to who was the inspiration behind Julia just google "Marianne Faithfull" and "leather outfit". Shinichirō Watanabe would never ruin his reputation by doing a tacky spin off series just for ratings — but if he did I'd love to see Faye and Julia in a remake of Thelma and Louise (and yes I know that makes no sense in terms of the plot of Bebop). Is Spike dead? No he can't be dead! Is it all a dream? Can this amazing anime series actually be over? 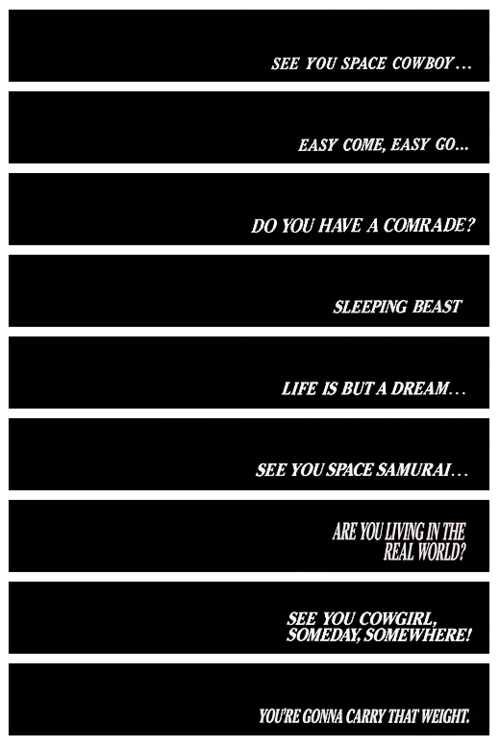 Those little notes at the end of each episode always added that nice little touch that made Bebop so unique.